Lily is our third dachshund, and I affectionately refer to her as our happy accident. Unlike the others whom were methodically planned; Lily was a foster failure that just happened when we least expected. My love for her is equal to the others, if not more as our precious little Lily Blossom, but… as is often the case, I have been much more relaxed with her upbringing. I believe it’s same with human children based on what all my friends tell me. With Rufus, I was systematic with his crate training, daily walks and weekly play dates. Eight years later when Emily arrived, I was less regimented but still focused. By the time Lily arrived, I was much more carefree. If you include Milo, Lily was my third puppy in the span of four years. Rufus and Emily both got a grand 1st birthday party, but with Lily I was so busy and tired after my gallery show, that we simply met informally at a local dog park with a few friends. I’ll occasionally feel bad for my little Lily – as though perhaps I have failed to deliver the same magnificent grandiose as I have the other two, but from the looks of it, I don’t think she really cares. She’s a very happy dachshund enjoying life, but to give me peace of mind, I finally got Lily her first big girl collar courtesy of our friends at LuxeMutt. 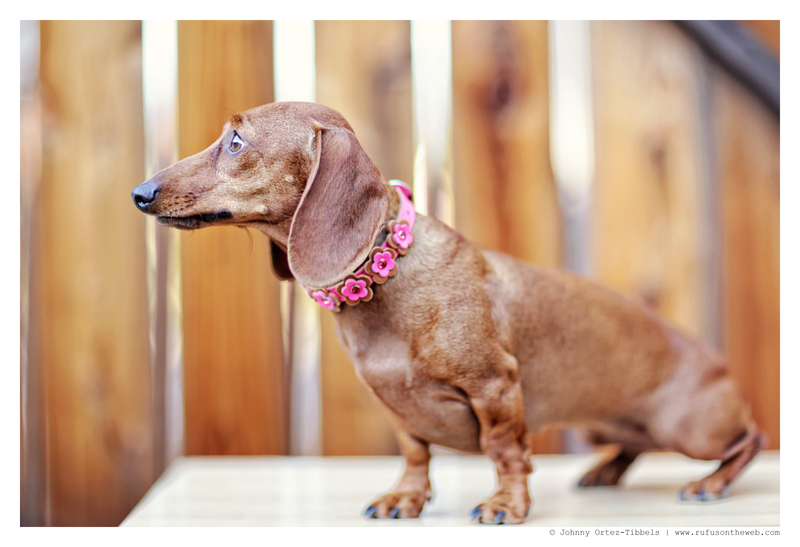 She was previously wearing one of Emily’s hand-me-down collars (also from LuxeMutt). I believe she wears it well. What do you think friends!? Now both of my girls have their flower collars. 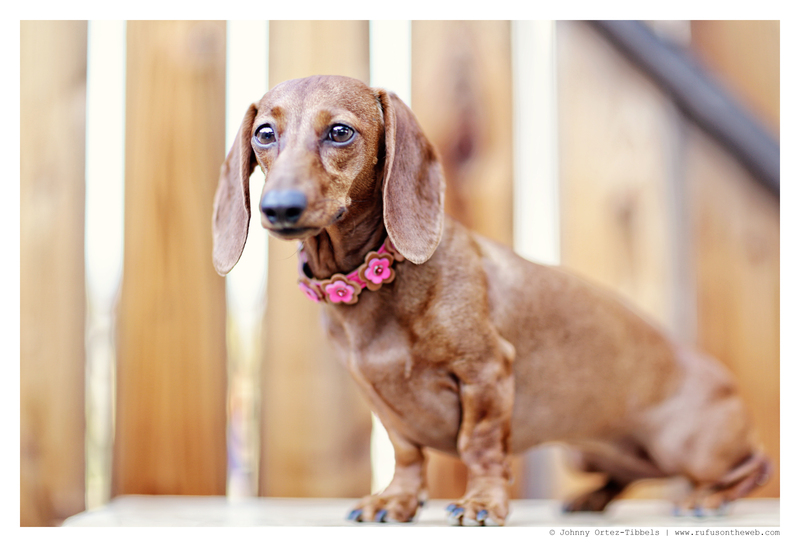 This entry was posted in Lily and tagged #ADachshundsLife #HappyHounds, #dachshund, #red dachshund, #smooth dachshund, #WienerDogs #HotDogs, doxies. Bookmark the permalink. She is a beautiful girl and looks so much like my little Molly Ann, who was also a happy surprise. She was a retired breeder dog and had not had a very good life prior to coming to be our baby. We’ve spent much time making up for the unhappy years of her life. She looks perfectly content. Love the collar Lily! !